So far every other class has at least one and I believe as a fighter this will even the playing field. 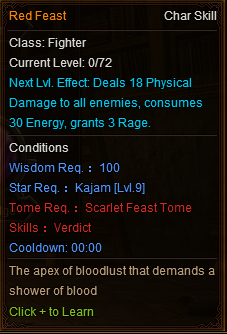 Red Feast: Required star level: 9 (Kajam) Another skill that is not yet implemented, BUT, it is the only;area of effect skill;that fighters have, I will need to think a little bit on using this tho. This as it is isn\'t much; however, with the goddess update I believe Red Feast II is much needed for Fighters at this point in the game. My name is Cola and I approve this message ! C\'mon, what kind of fighter wouldn\'t agree? Fighters are weak in PVP. We need some upgrades,,Spiritus beginning skill is beyond imbalance and Knights are almost up there.. I would agree if the Dev\'s gave Magi\'s a skill that also healed us. Or a skill that also greatly increased our defence as well as doing great damage. Classes are meant to be different, hence otherwise we would all be the same. Fighters have no AOE BUT they do incredibly high single target damage. You have a skill that targets back row. Fighters are easily the best class for Bosses (WB, SA etc). Would you take a 15-20% nerf on your single target dmg to get an AOE? 2019-4-22 00:45 GMT+8 , Processed in 0.066186 second(s), 46 queries .